MiMi made a lot of cute birthday cakes for us over the years. Of course most of the cute ones she made for me I only remember through pictures. But as the oldest of 6 kids, there were plenty of little ones around to make cute cakes for throughout a good portion of my life. My littlest sister, Chloe had some cute ones that I can remember. 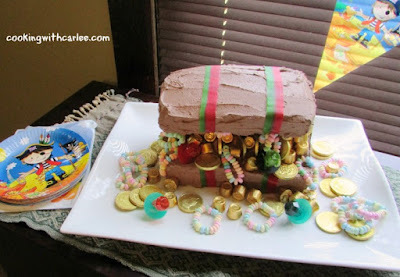 But the favorite cake my mom made was a treasure chest cake. She found the idea in a Family Fun magazine, and if I remember correctly it made an appearance at more than one birthday. It was always a hit. So, when we decided to throw Cap'n Jax a pirate party for his birthday, I knew I had to make a cake like the ones my mom made. I remember hers looking a little less like a preschool project than mine did, but mine was delicious all the same. Instead of baking it in 2 rounds, I made a 9x13" cake and just added a few minutes to the bake time. Then it was assembly time! I won't go through all of the directions to put together the cake, because if I had it to do again I would do it differently. But one delicious and easy chocolate cake covered in 1 1/2 recipes of chocolate buttercream and stuffed full of candy is sure to be a hit no matter how you put it together. Jax certainly loved it and that was the most important part. He kept having everyone go look at it and he probably told me how cool it was at least a dozen times! Of course this frosting is good for more than making treasure chests. It would pipe great on cupcakes and works perfect spread over sheet cakes. You can play with the proportions a bit to get the texture you like. Cream butter until smooth and fluffy. Add remaining ingredients and beat until completely combined. Frost your cake or cupcakes right away. To use from the refrigerator, bring to room temperature and then beat for a minute or two or until fluffy again before using. For more great frosting recipes, check out my pinterest board! 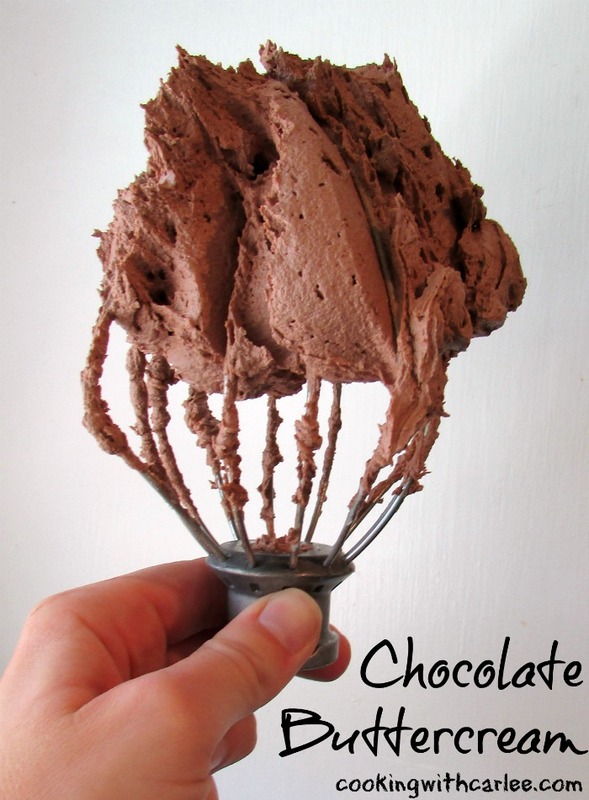 I've been looking for a good chocolate buttercream. This one looks delicious. Thank you! It is a good one! This looks sooo good, Carlee! I've been craving it ever since seeing the photo on facebook! I think you and I are cut from the same cloth! MMM! That is one of my favorite combos too, I nice moist buttery cake with chocolate frosting! Thank you! Thank you! I had so much fun getting ready for his party. I love buttercream frosting. I have never made chocolate though. Sounds delish! Oh yes, please, Carlee, I'll have some of this! Heck, forget the cake, I'll just take that whisk!! You and me both, Mollie! I hope you love it, thanks for stopping by! Your little guy is just adorable and that buttercream is amazing! Thanks so much for sharing with Full Plate Thursday and have a great weekend! Thank you! He really is a sweet little guy! I could lick that beater! LOL But, seriously! I used to decorate cakes for a living, but I found that I was coming down in the middle of the night for spoonfuls of buttercream icing. 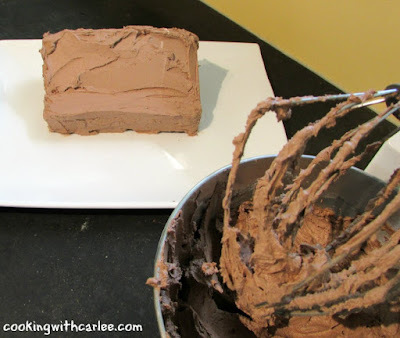 I am seriously weak when it comes to great frosting! I would eat it til I was sick. This looks like one of those recipes that I would absolutely love, I'm saving it for the next cake I make, it must have this icing! I would totally do the same thing... I can't be trusted with things like frosting in the fridge. What might start as just a little taste could quickly spiral out of control! I haven't been over to see what you have going on that's new, but wanted you to know I was here sorting through your frosting recipes deciding what my husband will get on his birthday cake tomorrow! Only one place to look for frosting recipes.... Cooking with Carlee! Thank you!! I hope you found a perfect one!